The Monk George of Iveria and Athos, was born at Trialeti (a region of Southern Gruzia, the European Georgia) in the year 1009 (or 1014 by some sources) into the family of illustrious landowners named Maria and Yakov. And his father under a commission of the Gruzian emperor George I (1014-1027) journeyed to the Persian shah in the capacity of an envoy. When the boy turned age 7, his parents brought him to the Tadzri women's monastery, where his elder sister Tekle (Thekla) was being educated. Saint George spent three years here, and during this time he was twice miraculously saved from perishing by the Providence of God (in the River Ktsia, and another time from the flames of a fire that raged through the monastery). In 1019 at the request of his uncles (his father's brothers) – George the Scribe and Savva, who pursued ascetic life at the Khakhul' men's monastery, – the lad George received the blessing of the Khakhul' monastery head Makarios to be tutored under the strict ascetic Ilarion Tualevi, who was reknown for his knowledge and profound spiritual life. In 1022 Saint George was sent off to Constantinople, where over the course of twelve years he diligently studied the sciences (i.e. various disciplines) and he received quite an excellent education. After his return to Gruzia in 1034 he took monastic tonsure at the Khakhul' monastery under the blessed elder Ilarion Tualevi. A certain while later the Monk George gave away all his clothing to the poor whilst attiring himself in old tatters of clothing, and set off to venerate the holy places in Palestine. After a short stay at various monasteries on Black Mountain near Antioch, the Monk George set off to the Wondrous Mount, to the monastery of Saint Simeon Divnogorets ("of Wondrous Mount", + 459). He found there a spiritual guide in the elder George the Silent (+ 1068), who was also a Gruzinian, living in the crevice of a cliff. 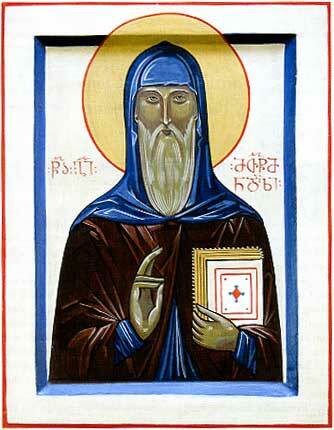 He spent three years at the monastery of Saint Romanos (from 1036- to 1039). At thirty years of age the Monk George accepted the monastic great schema from the elder George the Silent. And then in parting from him, he set off to Athos, to the Iveria monastery. Along the way the saint visited Jerusalem and prayed prostrating himself at the Sepulchre of the Lord. The Monk George arrived at Athos in the year 1040. Here he continued with the transcription work of the Divine-service books and the works of the holy fathers of the Church, a task that had been started by the Monk Euphemios of Iveria (Comm. 13 May). And at present the Gruzian-Georgian Orthodox Church recognises as canonical and permissible for church useage only this redaction of the Holy Scripture, ascribed to the pen of the Monk George of Iveria, who worthily completed the work of the Monk Euphemios. In the Vita-Life of the Monk George there is included an incomplete list of his translations from the Greek: the Great Synaxarion, the Acts and the Epistles of the Holy Apostles, the twelve Divine-service Meneions (i.e. for each month), the Oktoikon ("Eight Tones"), the Triodions (the Lenten and the Bright-Paschalion), the Trebnik (or Euchologion, "Book of Needs"), the Psalter, the complete Chasoslov ("Book of Hours"), the "Hexaemeron" ("Six Days") of Saint Basil the Great, the Letters of Saint Ignatios the God-Bearer, the OEcumenical Letters of Saint Cyril of Alexandria, a Book of Saint Gregory of Nyssa, a Book of Saint Theodore the Studite, a Book of the Proceedings of the Sixth OEcumenical Council, and "many another useful and holy book". From the translations of Saint Gregory of Iveria, from the Latin into the Greek there has come down to us the reknown work of bishop Dorotheos: "Concerning the Seventy Disciples of the Lord". Widely reknown also is an original work by the Monk George of Iveria, the "Vitae of John and Euphemios", which provides a detailed account about the founding and inner life of the Athos Iveria monastery under its first elders and heads – the Monks John and Euthymios (Comm. 12 July and 13 May). After a year of obedience, the Monk George in 1042 was ordained to the dignity of priest and was appointed elder priest-monk at the cathedral church. He fulfilled likewise the duties of regent (choir-master). His time not involved in Divine-services he devoted to translation activity and poetic creativity. The Athos hymn-writing of the Monk George of Iveria, in particular the reknown "Evening Bell" was afterwards translated into many an European language. After the death of the Iveria monastery hegumen Stephanos Khartulyari, the Monk George was chosen the new hegumen (the lots thrice pointed to him). Under the charge of the new hegumen, the monastery cathedral church in honour of the Dormition of the MostHoly Mother of God was rebuilt and made more substantial, and Gruzian dominion over the Iveria monastery was acknowledged. To this end the Monk George made visit to Constantinople, where he was admitted by the emperor Constantine IX Monomakhos (1042-1055), and received from him a grammota deed of endowment. Having returned to the Iveria monastery, the monk left as its head George Oltiseli in place of himself, and he set off to the Black Mountain near Antioch. Actually, he was compelled to do so, since he had to defend before the Antioch Patriarch Theodosios III (1057-1076) the brethren of his Iveria monastery, who were suspected by the Greeks of being non-Orthodox. The Monk George succeeded not only in accomplishing this task, but he also persuaded the Antioch primate of the canonical legality of the autocephaly of the Gruzian-Georgian Orthodox Church, – preserving its Apostolic Succession back to the holy Apostle Andrew the First-Called. From Antioch, at the invite of the Gruzian emperor Bagrat IV ((1027-1072), the Monk George set off to Gruzia. In Gruzia he spent five years: he taught the people by word and by deed, he assisted in the improvement of church life and he introduced his books of translation. Due to their highly erudite and literary quality, they were acknowledged by the Gruzian-Georgian Church as exemplary. Having in mind the spiritual enlightening of the land, the Monk George selected 80 Gruzian youths and set off with them to Athos, in order to give them the fundamentals of an education. Along the way he visited Constantinople. Despite the agreement with his students to put off a meeting with the emperor, because he had taken sick and was aware of his own approaching end, the saint nonetheless hastened to present his students before the emperor Constantine X Lukas (1059-1067), and he received a grammota-decree for their education at the Athos school. On the following day, 29 June 1065, Saint George peacefully expired to the Lord. The body of the monk was reverently conveyed to Athos, and it was glorified along the way by evident signs of God's mercy. It lay for a year in a coffin without burial in the church of All Saints. When the coffin was opened, the body of the saint was totally without decay: not one hair fell from his head or beard. The coffin of Saint George was put near the reliquary of Saint Euphymios on 24 May 1066, on the day commemorating the memory of the Monk Simeon Divnogorets. With the consent of the Katholikos-Patriarch of All Gruzia John IV (1110-1142), annually on this day was celebrated the memory of Saint George, but later it was moved to the day of his blessed repose, and at present it is celebrated on 27 June.